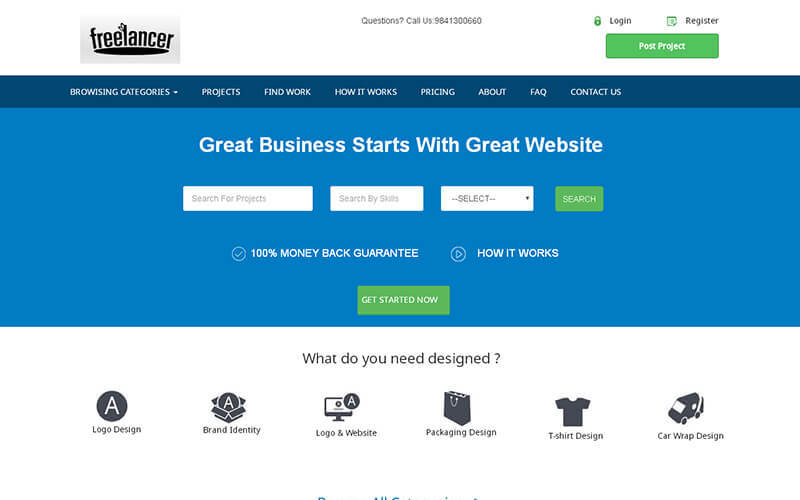 Guru Clone Script is designed mainly for finding the quality employers and freelancers in one place with flexibility. Nowadays the finding or recruiting of the qualified employers is much more complicated for the recruiters to reduce this complexity we have developed this script and this script can also be used for the freelancer job-portal site where the people who like to work as the part-time or full-time job independently based on their skill, this Guru Script can be customized globalized or localized based on the user or industry requirement. The Freelancing now has become a career direction for many people so they willing to this emerging script. This 99designs clone script is designed as the professional Freelancer job-portal site where the users can register for the searching the job as the employer category and Freelancer can register as the hiring of the project or working of the project. The user can register with valid mail id and password, and then the user can submit their profile by entering the skills and by posting the projects on the script, we have an unlimited product category for the freelancers to post their projects under the certain category. The Freelancer can search and bid for the required project based on their skills. In our PeoplePerHour clone script the user can able to see the complete contact details,the number of bids, user portfolio, they can also view the list of invoices and his current jobs, the freelancer can also able to see the placed bid details, and also the transactions details are seen by the freelancer. In the user display, they can view the total number of registrations of the users, total number of posted projects, last month payouts etc. This PeoplePerHour script will help you to work your way as the part-time or full time job with secure authentication individual id. The admin can take over the control of the entire site by managing the user credentials and functionality of the employer management, freelancer management and transaction management etc. The admin can get revenue by using the banner advertisement, Google ads and the membership commission in our script. He can add or view the new location of the country listings and budget management like currency listings and budget listings etc. The site is made with user responsive, SEO-friendly URL to make easy access of the site, we provide some additional offer with this script by making the brand-free site, 6 months free update services, 24×7 technical support team help for your solution. I have gone through customization through this Guru Clone. Technical team gave me good suggestion to my site. Keep it up guys! Very fast and professional customer support I have worked with PHP Scripts Mall build website. Cool Support. Awesome script thank you guys.